With the Dublin: One City, One Book initiative for 2014 kicking off today, this year’s subject If You Ever Go: A Map of Dublin in Poetry and Song has been published, featuring a previously unseen poem by Seamus Heaney. The late Nobel laureate, who lived for many years in Sandymount, wrote a poem called Dublin 4 specifically for this publication. It came to be when the project’s organisers noticed that Heaney had written relatively little about Dublin during his life. This year’s Dublin: One City, One Book initiative sees events happening all over the city for the month of April. Next Tuesday April 8th, The Waterways Ireland Visitor Centre will hear an exploration of poetry and song inspired by the canals of Dublin. The event begins at 4.15pm and admission is free. Then on Saturday April 12th, a free walking tour will begin at the Peppercanister Church at 3pm, and will take you through the area around Baggot Street and the Grand Canal that features in the work of Patrick Kavanagh. The tour ends at the Waterloo Pub on Baggot Street, where musicians John Sheahan (The Dubliners) and Declan O’Rourke will be going through songs and poetry inspired by Kavanagh’s poem If Ever You Go to Dublin Town from 5pm. If you would like to enjoy a virtual tour of Dublin’s fair city through the eyes of some of the city poets, If You Ever Go: A Map of Dublin in Poetry and Song (Dedalus Press) can be bought for €11.99 or checked out of libraries across the city. A full list of this year’s Dublin: One City, One Book events can be found at http://www.dublinonecityonebook.ie/. 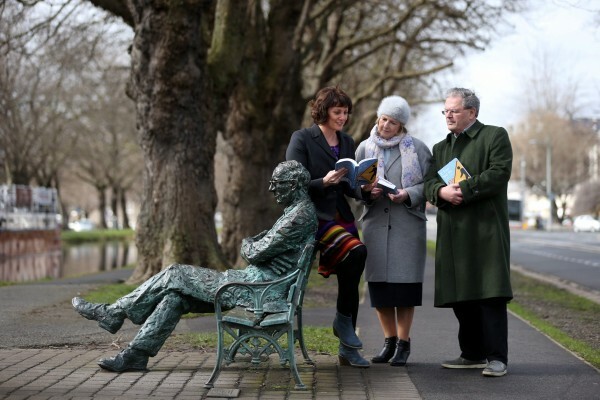 Image: Pictured at the launch of this year’s Dublin: One City One Book festival programme of events at the statue of Patrick Kavanagh on Grand Canal Bank was Poet Enda Wyley with Margaret Hayes, City Librarian, Dublin City Council and Poet, Gabriel Rosenstock. Picture Jason Clarke Photography.